I have done well this weekend...two projects besides wedding invitations. Here is a birthday card for my boss. It's her birthday next week and I volunteered to make the card for the team. I used sketch no. 48 from the Sketch Saturday blog. It's last weeks sketch so too late for me to include it in their challenge. I used my new set of Gorjuss Girls from Funky Kits and coloured her with copics. The papers are from Basic Grey - Bittersweet collection. 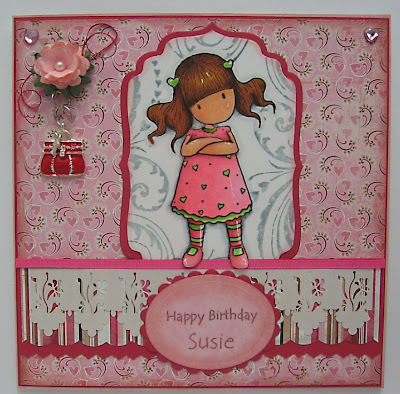 I have used a lovely 3-in-one punch from Craft Habitat - Kreaxions and Spellbinders oval. The sentiment was created using my Hot Foil Wizard pen. The rose at the top of the card was made by punching out 16 small hearts and gluing together using silicone. A pearl bead was used for the middle. Below is a closeup. 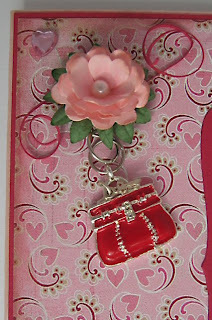 My boss is crazy about handbags so I added a handbag charm that I had received as a free gift from a card magazine a few years ago. For my second project I created a voucher pocket using 12x12 paper. 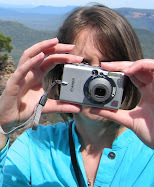 Anne Bodil has instructions on her blog along with inspiration! 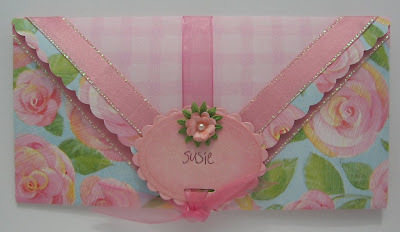 (Click here to view Anne's blog) Unfortunately, I didn't have any double sided pink paper so have had to stick two sheets together taken from the K&Co Tim Coffey Super K range. It's finished with ribbon to hide the edges. Thanks for looking.